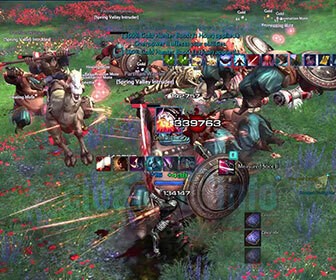 Knowing where and how to farm zawahide in Tera is important if you have a Slayer, Reaper, Archer or Warrior character. zawahide is dropped from various 60-65 mobs in Val Oriyn. It is a material used by Armorcrafters to craft Fine zawaleather. Fine zawaleather is a mat needed to craft some level 65 gear for medium / leather classes. [adblockingdetector id=”2″]When you are new to farming zawahide don’t expect to clear the mobs cleanly like some of your friends or guildies that have been doing it for a weeks or months. Expect to get knocked down a lot and even killed once in a while. To help prevent getting killed by the mobs a lot always wear your best PvE gear and have a good PvE DPS Crystal setup. To further aid your efforts of staying alive be aware where all of the health regenerating motes drop and pick them up whenever you can. When you see my zawahde farming video tutorial below do not be discouraged by how many mobs there are and how fast I kill them. I really am not that great at killing them and you will probably do a better job at farming zawahide than me with enough practice. I farm roughly 320 zawahides an hour, but you may get as good as my friend and farm over 400 an hour. Last note for the newbies, if the zawa farming area seems too tough then start in the beginner’s section. I show you the location of the zawahide farming beginner’s section toward the end of the video. 01. The main location to farm zawahide, in Amadjuak Trading Post which is located in Spring Valley. This is part of the 60-65 section located within Val Oriyn. 02. Crystals to use when farming zawahide: (4) Powerful Vyrsk, (3) Fine Pounding Niveot, (1) Fine Carving Niveot, (4) Fine Hardy Niveot. 03. Charms to use: Greater Power, Greater Endurance and Greater Infused charms. Use a Charming Campfire when farming so they charms last 30 minutes. 04. Good idea to use a Complete Crystalbind in case you die or get killed by another player while farming zawahide on a PvP server. 05. Farming process, rounding up and killing all of the mobs. 06. Tip: A pet with an auto-loot ability would great to have when farming zawahide. It will speed up the process since you don’t have to worry about picking everything up while killing mobs. 07. If you are an Elite subscriber always have a 100% Gold Hunter’s Boost activated. It will double the amount of Gold the mobs drop while farming zawa. 08. The second location to farm zawahide. It is a beginner’s section with less than half the mobs of the regular section. After you practice and learn to farm the mobs well you can move onto the main mobs for farming zawahide. If you have any QUESTIONS or COMMENTS about this Tera Tutorial / Video Guide on where to farm zawahide and how-to farm zawahide or have other questions relating to Tera, feel free to ASK FOR HELP BELOW!